When East Germany was officially declared a sovereign state in 1949 by the Soviet Union, it had already begun rearming in secret. It was not until the official formation of the West German Bundeswehr in 1955, that the East German's responded with the establishment of the National Volksarmee (National People's Army) in 1956 from elements of the Kasernierte Volkspolizei (Barracked People's Police). From the beginning the National Volksarmee was the 'Parteiarmee" tasked with defending the people and the Party. Under this euphomism, all officers were required to be members of the ruling SED communist party. Political officers charged with instruction of the troops on ideological, military, and global affairs formed an essential part of NVA daily routine known as Politische Hauptverwaltung (Political Main Administration). 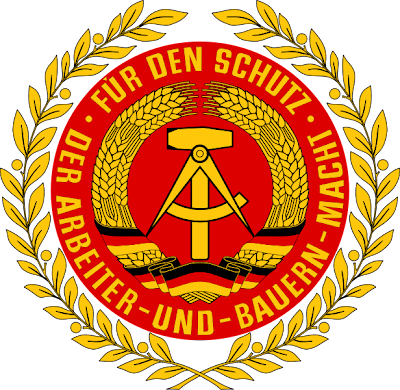 Like the Communist parties of other socialist states, the Socialist Unity Party of Germany, or SED, assured complete control by appointing loyal party members to top positions and organizing intensive political education for all ranks. The proportion of SED members in the officer corps rose steadily after the early 1960s, eventually reaching almost 95 percent of the total officer corps. The official emblem of the East German National Volksarmee reading "For the Protection of the Workers and Farmer's Power"
The NVA described itself as the instrument of power of the working class. According to its doctrine, the NVA protected peace and secured the achievements of socialism by maintaining a convincing deterrent to imperialist aggression. The NVA's motto, inscribed on its flag, was "For the Protection of the Workers' and Farmers' Power." While West Germany saw itself as the legal successor to the Third Reich, shouldering the burdens of legal responsibility for its crimes; East Germany renounced ties to the Nazi past, styling itself as the "anti-fascist rampart" and proclaiming itself the first socialist state on German soil. The uniform displayed here is the Ausgangsuniform (Semi-Dress/Walking-Out Uniform) for a Generalmajor (Major General) in the Landstreitkräfte (LaSK) which were the Army or Ground Forces. The rank of Generalmajor is equivalent to an American 1 star Brigadier General, a British Brigadier. The uniform is the standard stone grey color of all National Volksarmee (East German Armed Forces) services with the red colored piping and gold insignia denoting the wearer's status as a General officer in the Ground Forces. The pants are the standard stone gray color as well with the reflecting red striping running along the length of the pant leg. The tunic would be worn with a white shirt. During periods of warm weather, there was the option of omitting the tunic, and furthermore omitting the tie. The visor cap is of the gabardine material of all East German uniforms. Unlike West German uniforms denoting branch as the central insignia and then flanked by the national roundel, East German visor caps used the East German national insignia as the centerpiece with the national insignia of a hammer and compass surrounded by wreaths of wheat and German flags. Surrounding the roundel on this example are laurel wreaths and applied with a felt background against the face of the hat. This is unique to all General officer hats as other officers junior in rank wore silver metal insignias. Rather than wear wreaths on the visor like the West German's, East German officer's wore braided cords around the cap reminiscent of styles of previous German armies. Shown here is the gold metal Kragenspiegeln (Collar Insignia) of the General Officer Corps. They are nearly identical to the types of Kragenspiegeln worn by General officers in the Nazi Wehrmacht. 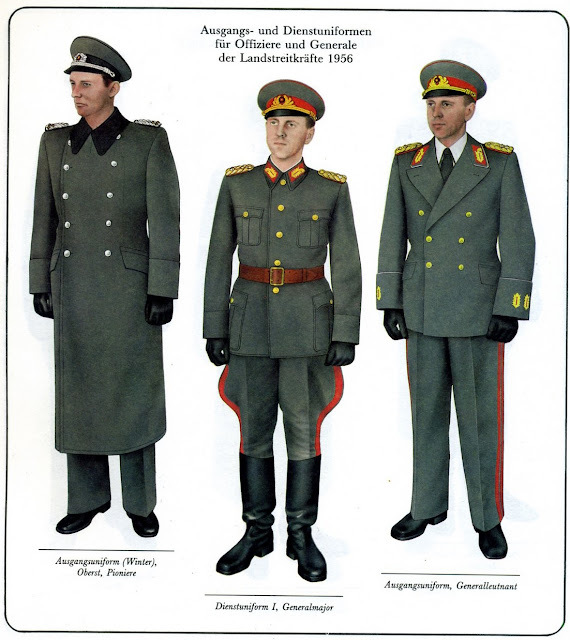 The East German military borrowed heavily from the previous regime in terms of uniform style as well as maintaining a sense of Germanic tradition in using heavy Prussian influence. Shown here is a detailed picture of the shoulder board insignia of a Generalmajor of the Land Forces. Here shown are the gold buttons of a General officer bearing the national hammer and compass insignia of the German Democratic Republic. General Officer Corps red waffenfarbe stripe around the cuff of the uniform sleeve. On the right side of the chest would have been an Academy badge denoting the officer school that the General attended. On the left side of the chest of the uniform would have been either medals or a ribbon bar depending on the type of event attended. An illustration displaying the Ausgangsuniform (Semi-Dress/Walking-Out Uniform) and the Dienstuniform (Service Uniform) of officers and Generals in the Landstreitkräfte (LaSK). The center picture showing the Service uniform, and the right displaying the Semi Dress uniform configuration.